Leshrac's servant, the Weaver King, is gone. But that only means his servant's servant now has no master. There is no point in letting such a good tool go to waste, and it most certainly would if Leshrac doesn't step in and do something. Dinne il-Vec's mind was so battered and beaten into submission over the years, so used to following orders that when Leshrac arrives on Urborg to stake his claim, he finds the shadow assassin simply sitting on a pile of bones and staring. With a taste for only killing at night unless commanded otherwise, all the assassin does day-in and day-out is sit in a near catatonic state. Coincidentally, as Leshrac has come to Urborg for his own reason's, Leshrac feels another powerful presence arrive. But that would have to wait until later. Leshrac leaves himself in a noncorporeal state as me makes first contact. He tells the assassin that he's his master's master, and now he has come to claim him now that his master is gone. The assassin doesn't react. Leshrac knows he has next to no emotions, and hardly ever acknowledged the Weaver King except to follow orders, so his lack of response isn't unusual. However this quirk of his makes it hard to determine if he understands. Leshrac makes himself visible and instantly Dinne attacks. This just won't do. Leshrac blows a mocking kiss at Dinne, and the assassin begins convulsing. The convulsions aren't physical either. The Weaver King had completely broken Dinne's mind over the decades, removing all guilt, all remorse, and all emotion from the assassin. What Leshrac decides to do is fully restore his mind, all at once. He does so to give him a taste for what it means to become whole again, and give him some understanding of all the heinous acts he's committed throughout the years. "Do my bidding well and I will restore what was taken from you - without the pain and guilt. Day by day, hour by hour you will recover those parts of yourself that you don't even realize you miss. you will thrill to hunt again. You will know the exquisite uncertainty of joining combat against your equals and betters. You will be able to feel... joy, rage, satisfaction. You will be able to choose. You will be able to act." Leshrac tells him that he can have a chance at a lifetime of freedom. All he has to do is serve for just a few weeks. What he doesn't tell the assassin is that it is, of course, a lie. But hope allows for more willing servants. Leshrac returns him back to the efficient killer that he was and leaves him with the simple orders to be ready for a summons at a later time. Jhoira tells Jeska everything, while keeping keen watch on this new planeswalker in their midst. 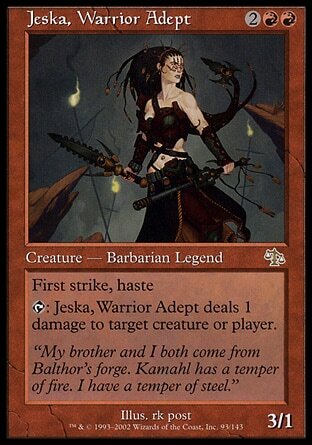 Jeska is unlike any other planeswalker she has ever met. 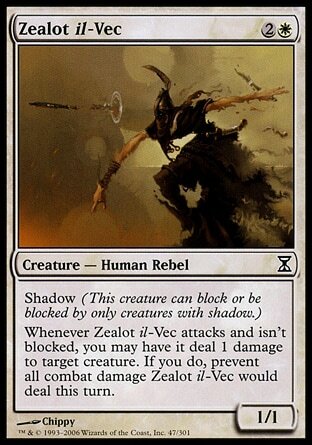 She is very straightforward as planeswalkers go and seems uncomfortable with her god-like powers. When Jhoira is done talking, Jeska isn't too impressed. All they've been doing is reacting rather than following through on a clear strategy. 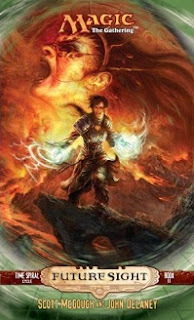 She asks how they know so much about the rifts and Teferi says because he has a connection to him, an awareness of them. "Well, there's the missing piece of your half plan. You should have been using that awareness to guide your actions all along." "No." Jeska shook her head. "Your prioirities keep shifting. You do things piecemeal. Every most-urgent rift you seal creates a new most-urgent rift." Teferi shook his head and smiled a strained smile. "I think you've misinterpreted-"
The red-haired planeswalker angrily ticked off points on her fingers. "Fixing the one in Shiv turned the ones in Keld and Urborg into doorways that brought monsters in from another place and time. Right? And sealing those two didn't stop the time distortion, so you had to send Karn to Tolaria. You may have considered where you're going next, but have you even considered what fixing it will do?" Jeska challengingly asks him what their next step is and Terferi first explains the conditions of the next rifts. 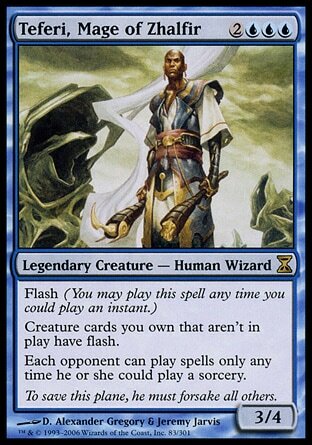 Zhalfir is the most stable right now, especially because it's Shivan counterpart is sealed. Yavimaya will be more challenging but they expect to have an ally there, and then Madara and Otaria are behaving in ways he doesn't quite understand yet. He adds that Jeska seems especially attuned to the Otaria rift, but she cuts him off because she hasn't even decided to work with them yet. When posed with the question which they'll attack first, Jhoira jumps in and says that Yavimaya is next. Once again Jeska doesn't like their strategy. They should have an overall plan. They need to scout out Madara and Otaria before deciding what to do, rather than just attack whichever seems the most disruptive at the time. They need to treat this as a campaign and not a science experiment. Jeska gets all the info she wants, and tells them she needs to think. She might still want to find Karn above all else. She leaves them on good terms and they promise to inform each other if they discover anything about the silver golem. With the planeswalker gone, Teferi asks her why Yavimaya? Jhoira explains quite thoroughly to Teferi and more important the still fairly ignorant Venser, that Yavimaya should be next because the forest is the planet's largest source of green mana, and that the forest has a huge collective consciousness. The avatar of that consciousness, Multani , has helped them in the past, and they may not even need a planeswalker to seal that rift if they have his help. Very nice. It just took this one chapter and now I've warmed up to Jeska considerably. 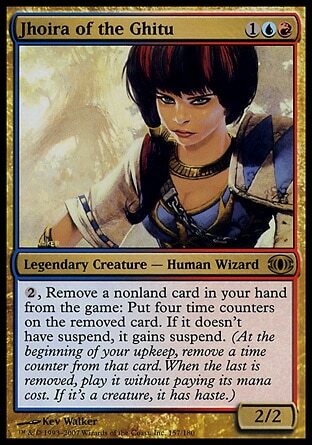 She's not just a planeswalker version of Radha. She's not a single-minded, blood-thirsty warrior that will do whatever she wants no matter what is happening in the larger scheme of things. She may prefer hand to hand combat, and she may have trouble reading minds, but she still will take the time to think before acting if an opportunity presents itself. I'm glad she's coming into her own in terms of this trilogy. I thought Radha was fine as a character, but only for as much as we had her. I didn't want to read another book with the lead having her same personality. Here we have an evolution of Radha through the use of this character and that's comforting to know early on. I love Multani! I had so much fun playing multi-player with my Green deck that had him at the center of it. He has such a great ability that so clearly illustrates his power as a character with the story. 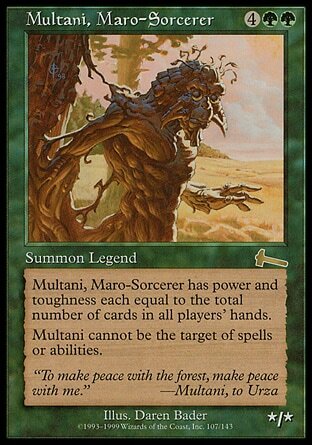 While it didn't cross my mind before that any non-planeswalker might be able to seal a time rift, if there is any one person that can do it, Multani is your guy. I don't actually know what happened with him during the Invasion, but I expect I'll be caught up soon.